Premier Energy is gearing up for Independence Day with a Fueling Freedom event you won’t want to miss! 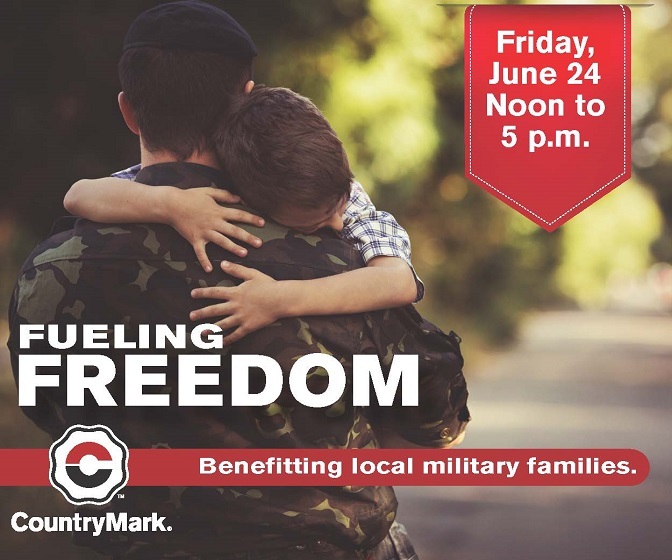 On Friday, June 24 between noon and 5 p.m. at participating CountryMark fuel stations, CountryMark will donate 50 cents for every gallon of fuel pumped to local National Guard Family Readiness Groups. Also at each Fueling Freedom site, customers and guests will be invited to register to win a $150 fuel card. Premier Energy’s two Greensburg CountryMark fuel stations will be participating in this year’s event. The stations are located at 766 W. Main St. and 1001 N. Lincoln St. in Greensburg. Both locations are convenient for consumer vehicles, but the Main Street location is a better fit for large trucks. CountryMark initiated the Fueling Freedom fundraiser eight years ago as a way to support military families. In 2015, CountryMark raised $54,000 for local National Guard Family Readiness Groups. Many of the Family Readiness Groups use their funds to host for soldiers and their families summer picnics, Christmas parties, after-school programs, as well as to send packages to deployed local soldiers. A total of 43 CountryMark fuel stations have signed up to take part in Fueling Freedom 2016, a record number of stations for the event. 5015 N. St. Joseph Ave.
3002 S. Decker Rd.Exact locations for all CountryMark retail stations can be found at the company’s online retail locator map.